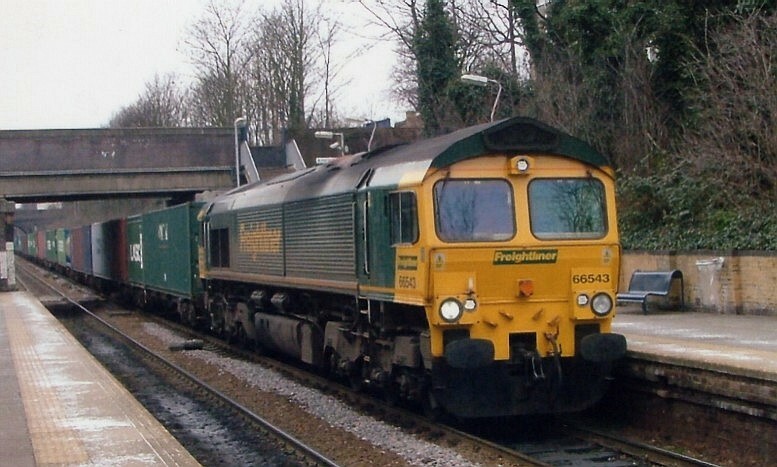 Freightliner's 66543 brings its eastbound train through Crouch Hill on the 16th February 2005. 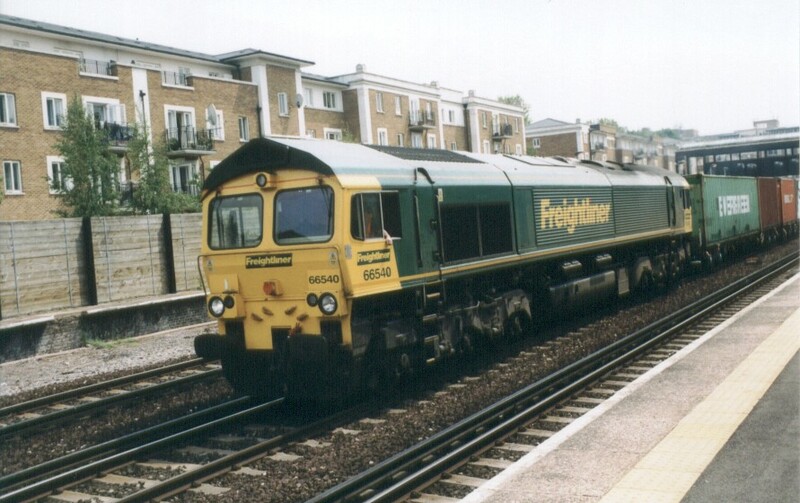 Freightliner's 66540 is seen at Kensington Olympia on 29th May 2003. 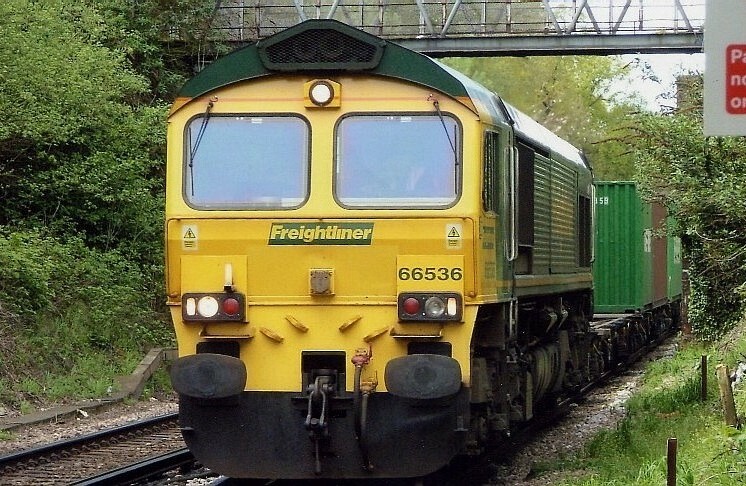 66532 is taking the up fast for a change providing us with a closer view of this 'Fred'...as Freightliner 66s are known as... at South Kenton on the 19th February 2004. 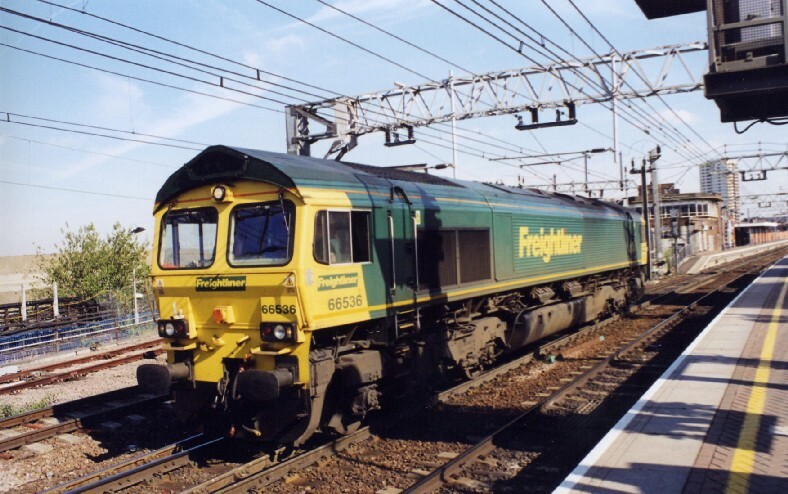 Freightliners 66536 is seen heading towards the N.London line at Stratford on the 25th September 2003. 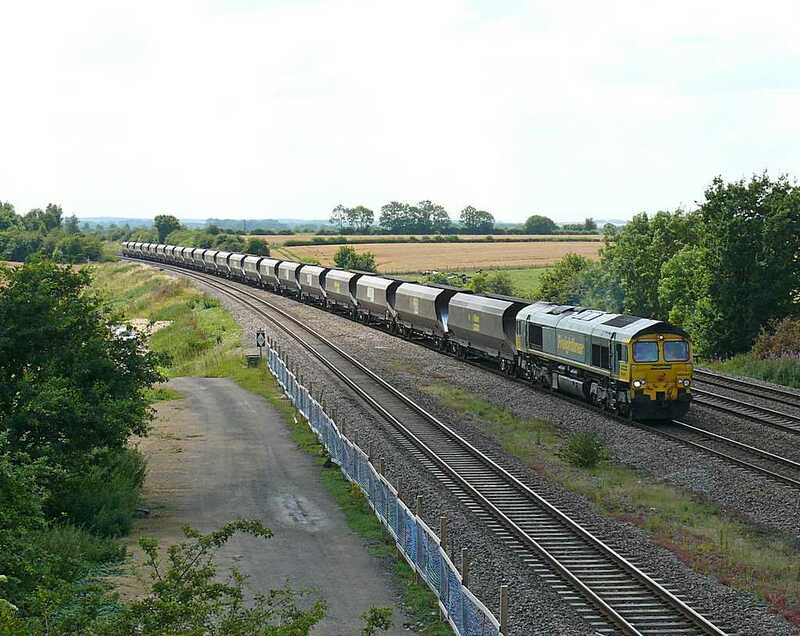 Freightliner 66544 near Barnetby on 20/09/05. 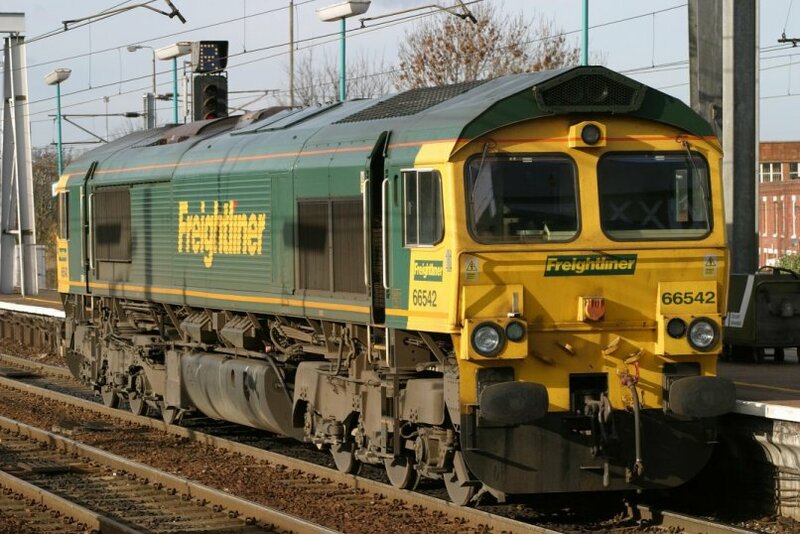 Freightliner 66544 seen near Bolton Percy on 24/07/14. 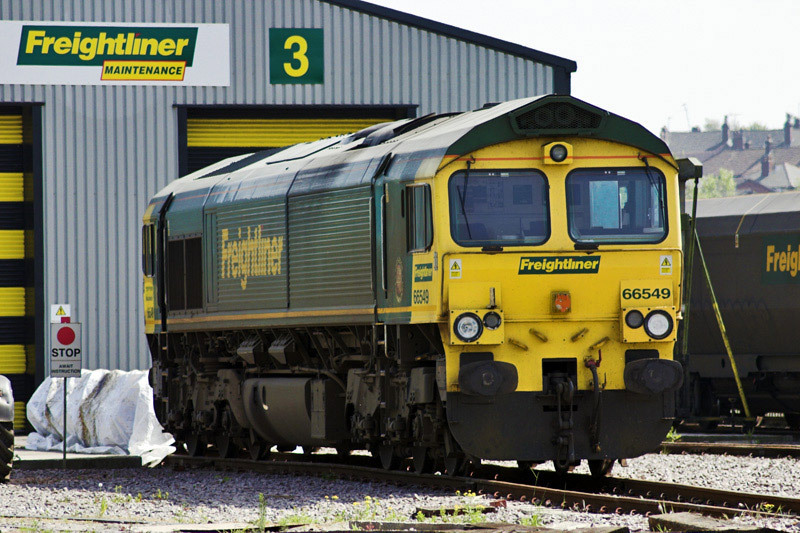 Freightliner Class 66/5, No: 66549, stands outside the shed at Freightliner's 'Leeds Midland Road' depot on Sat 5th May 2007 at 13:58. 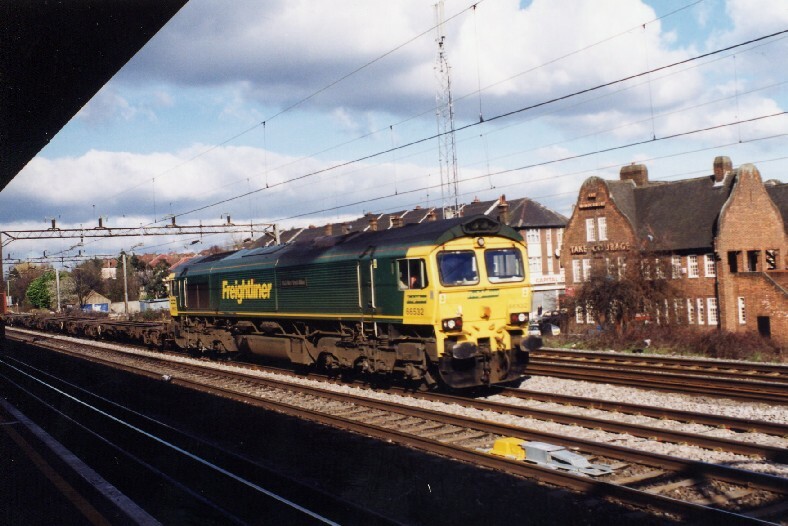 Class 66 Freightliner heading south through Oxford Station during April 2002. 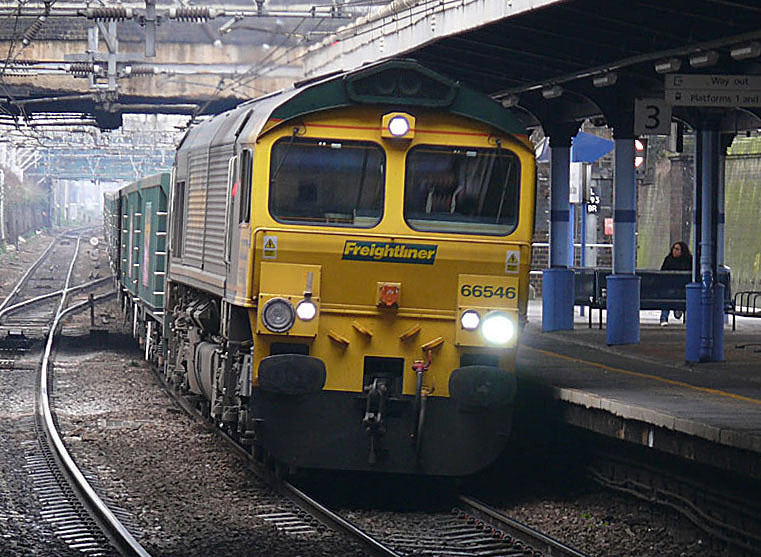 Another shot of Freightliner 66 531 heading south through Oxford Station during the afternoon. 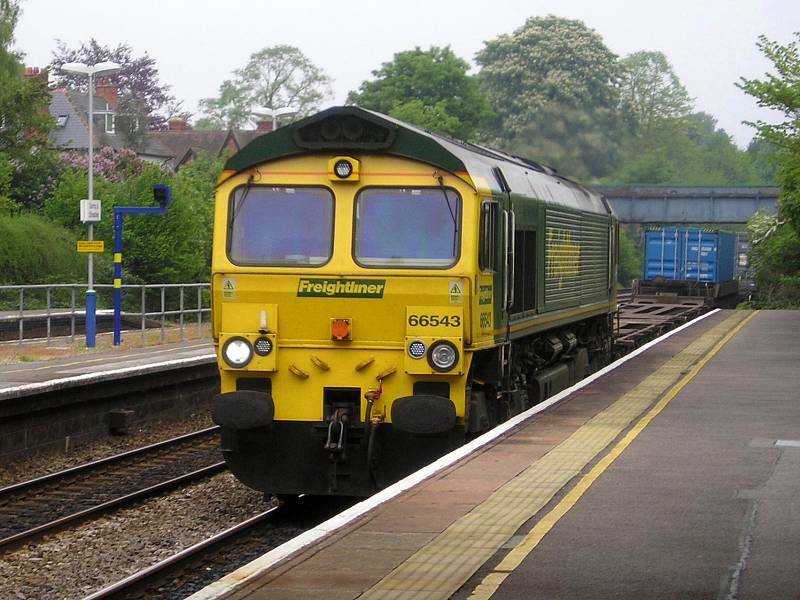 Freightliner Diesel (DE) Class 66 543 passing through Pangbourne, England on 11 May 2004. 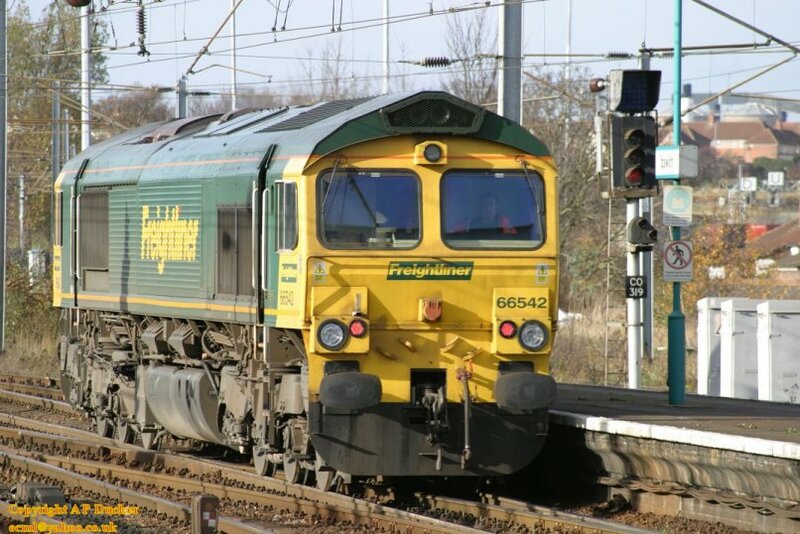 Freightliner Class 66 diesel locomotive 66530 heads east along the South Wales Main Line east of Cardiff Central, viewed from the window at the front of Coach A on a First Great Western HST heading eastbound to London Paddington. 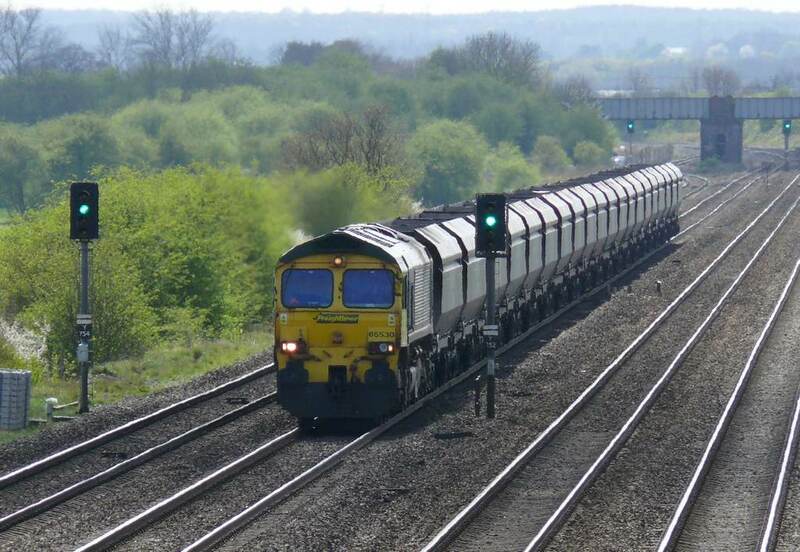 Class 66 seen heading north at Colton Junction, late April 2004. 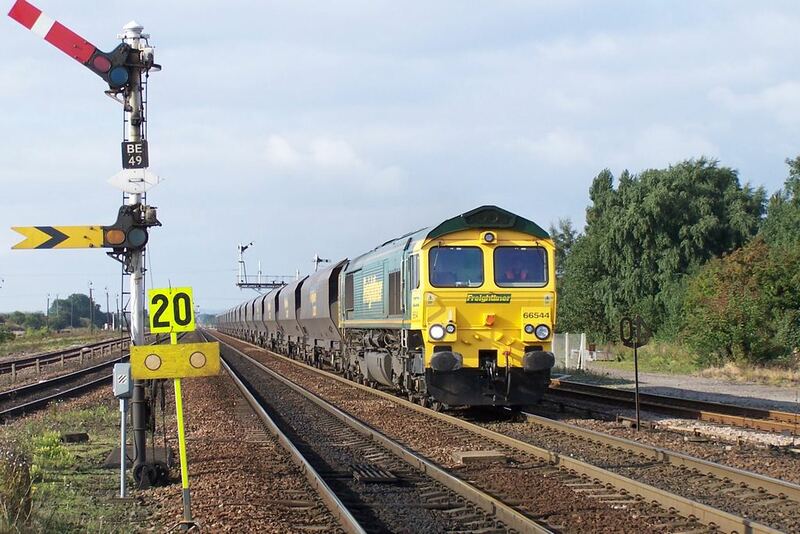 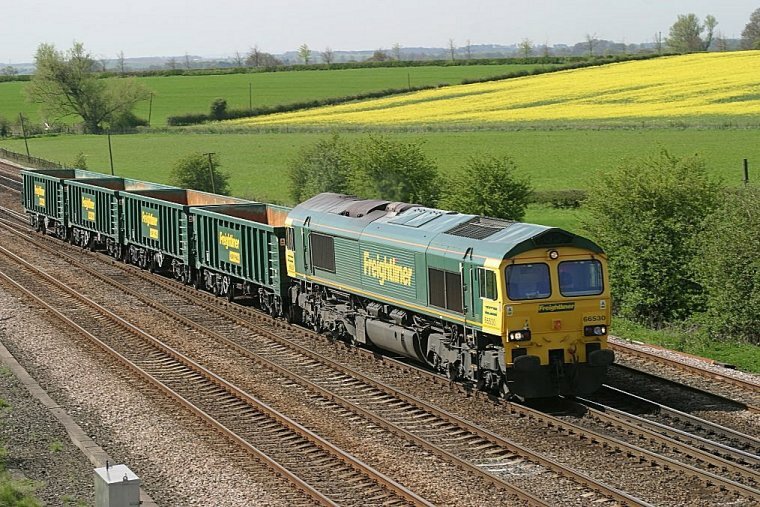 Class 66 Freightliner passing north at Colton Junction with some very clean Freightliner wagons. 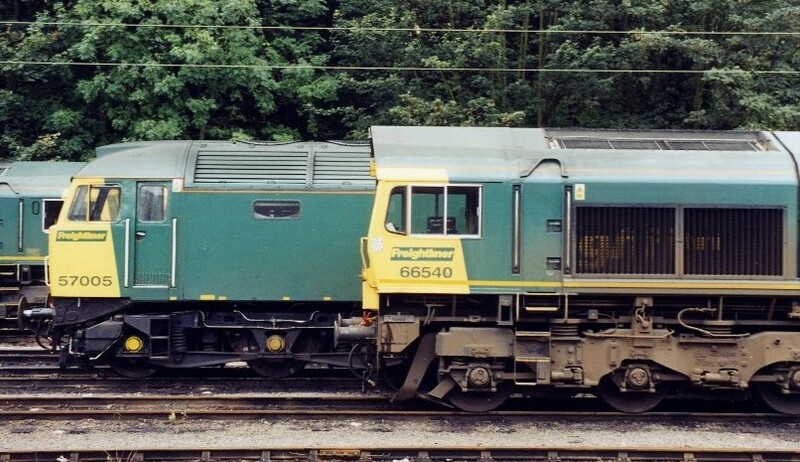 Detail of cab design of Class 66 locomotives seen at Ipswich on 02 APril 2004. 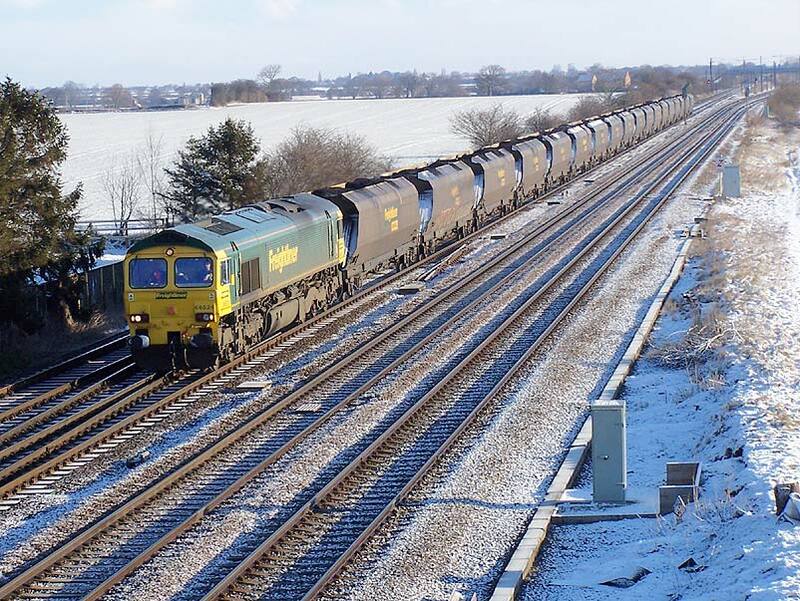 Copyright belongs to Andrew Ducker who can be contacted on ecml@yahoo.co.uk. 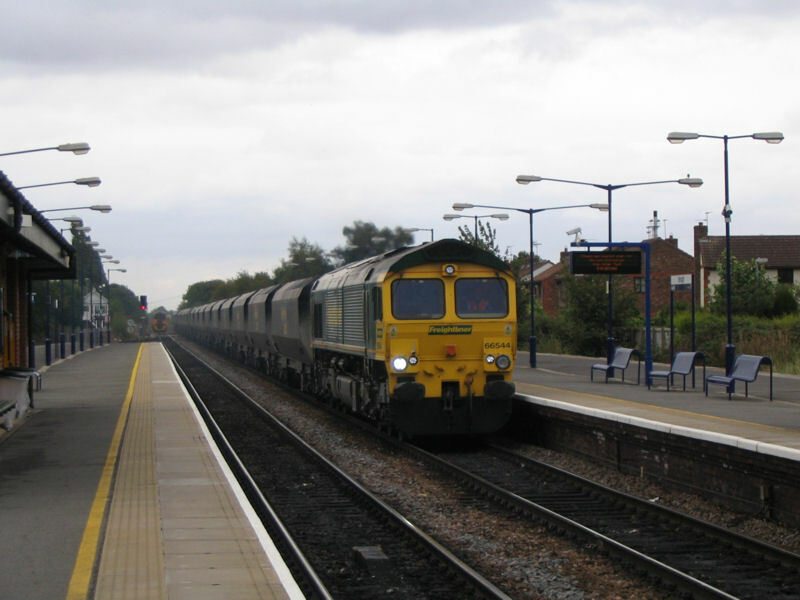 Photographs taken on Canon EOS10D Digital Camera. 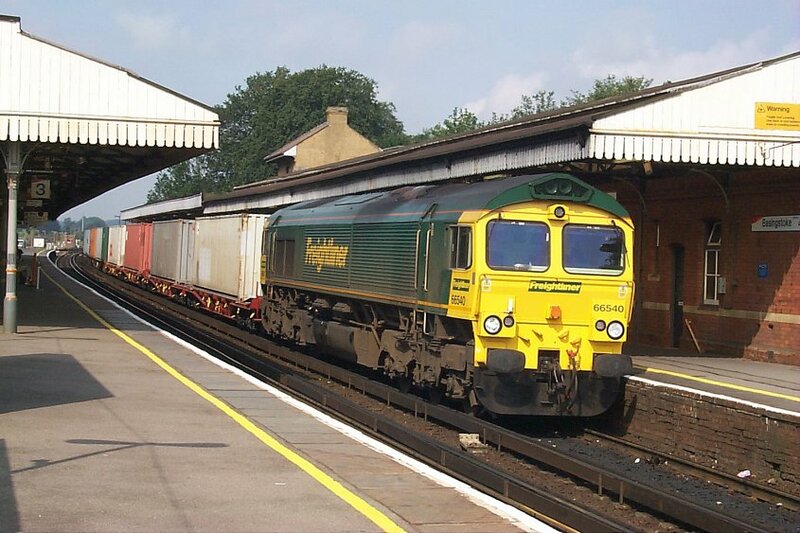 Class 66 seen passing through Basingstoke July 2002. 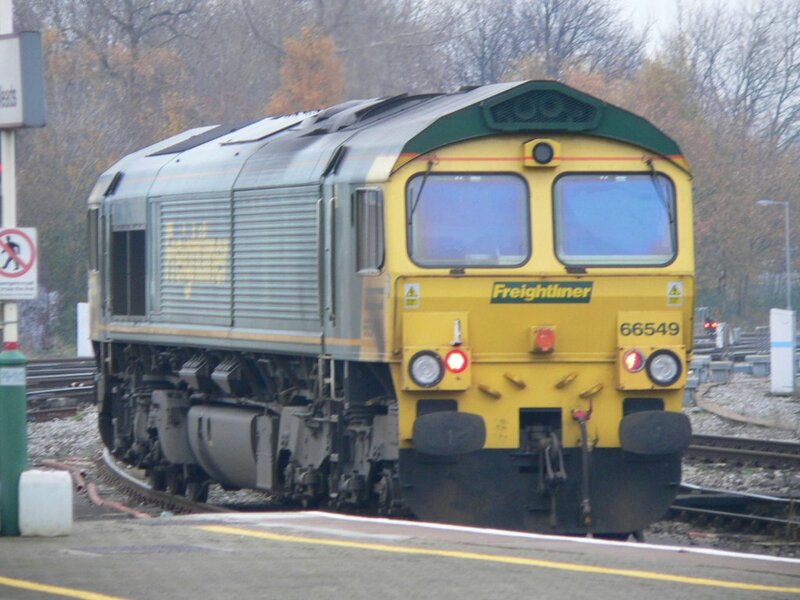 Class 66/5 seen at Ipswich Station on 15 November 2003. 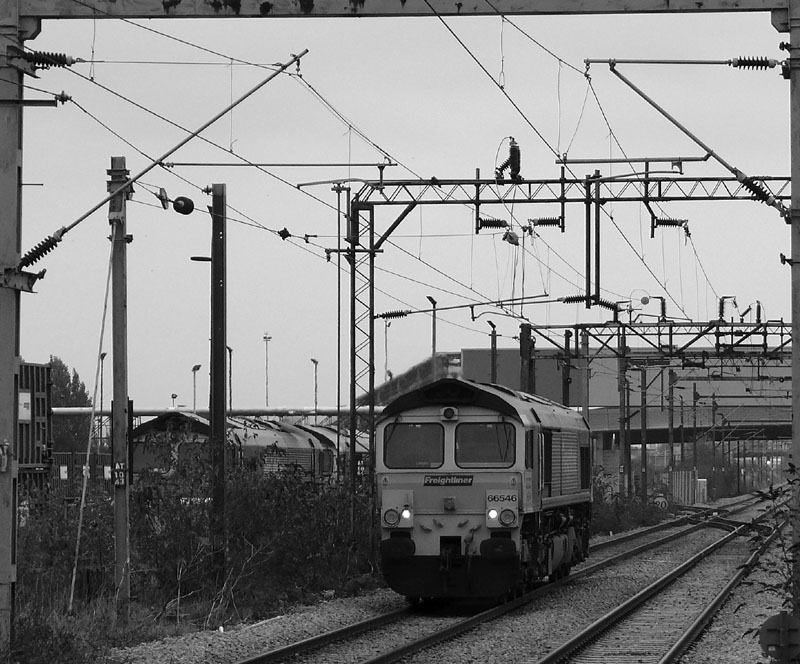 Photo taken on Canon EOS10D. 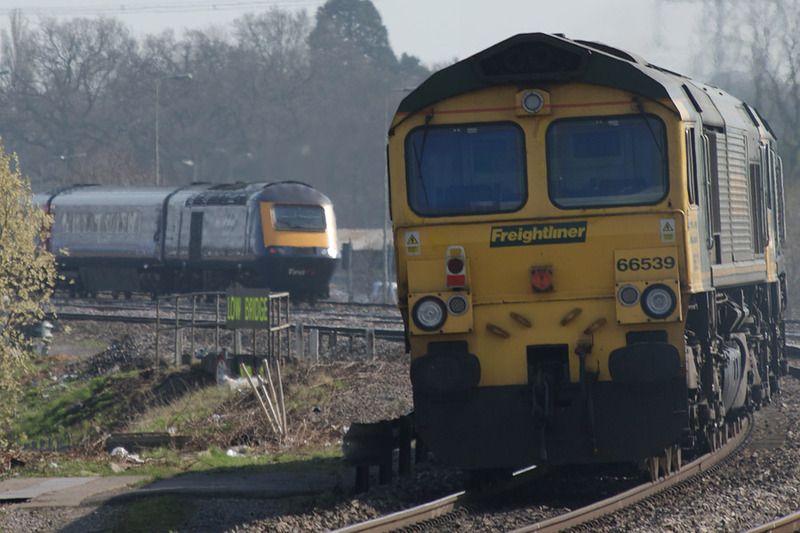 Freightliner Class 66 disel locomotive 66549 is held at red singal B51 immediately north of Bristol Temple Meads to allow an unidentified First Great Western HST access to the station. 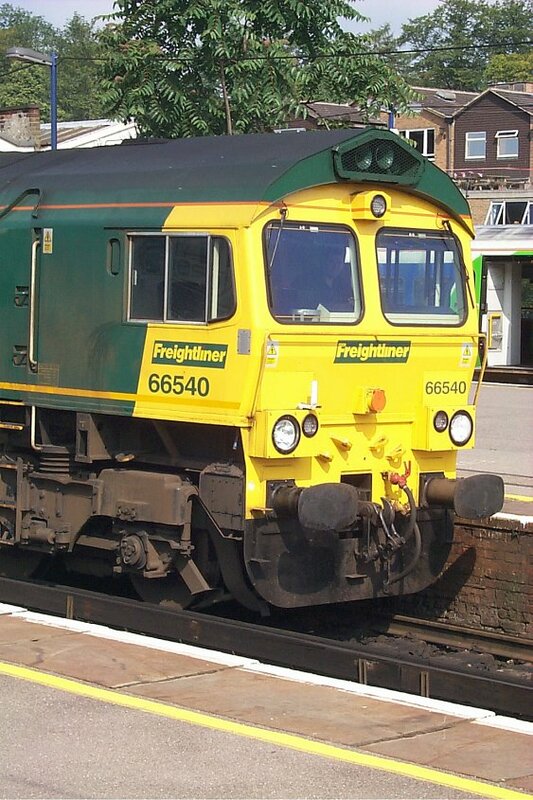 Photo by Chris McKenna 07/12/2005. 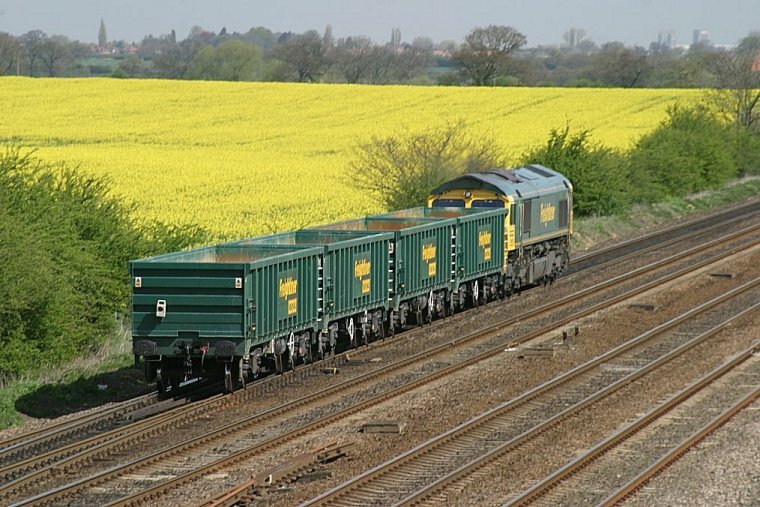 Larger, higher quality copies of most of my pictures are available, please email if you want a copy. 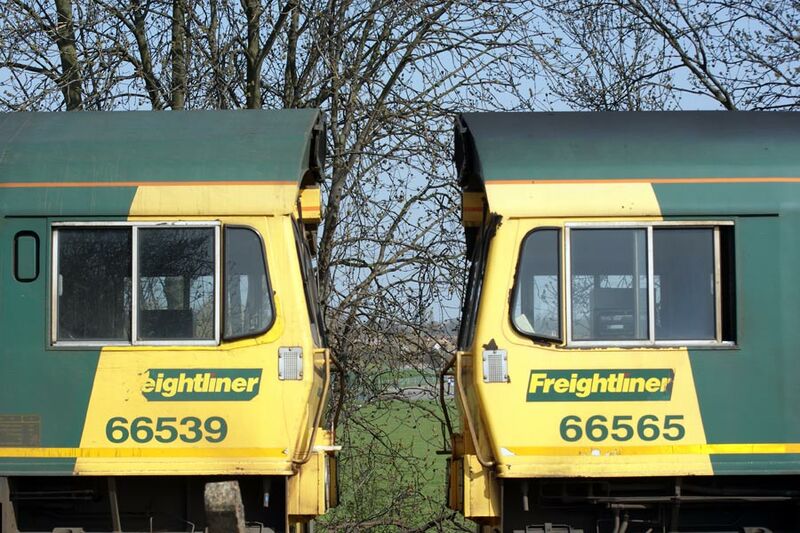 If you wish to use this, or any other of my photographs, under a different license see my relicensing policy. 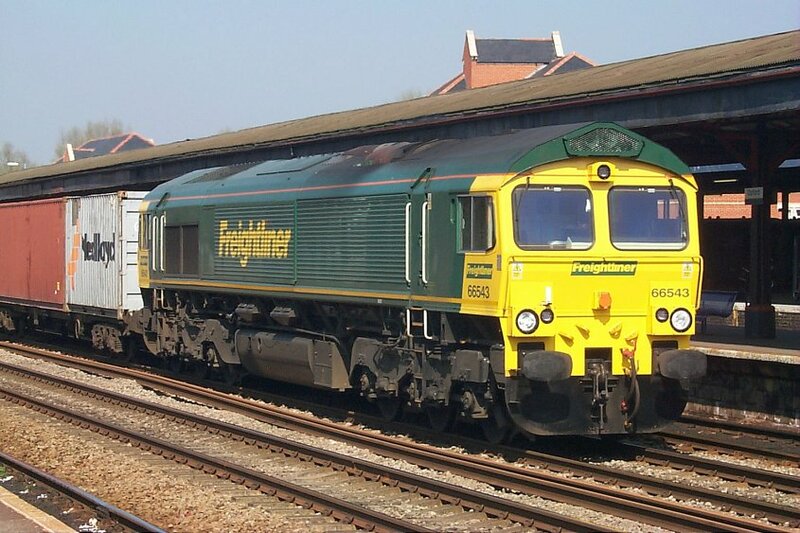 Freightliner Class 66 disel locomotive 66549 is held at a red singal immediately north of Bristol Temple Meads. 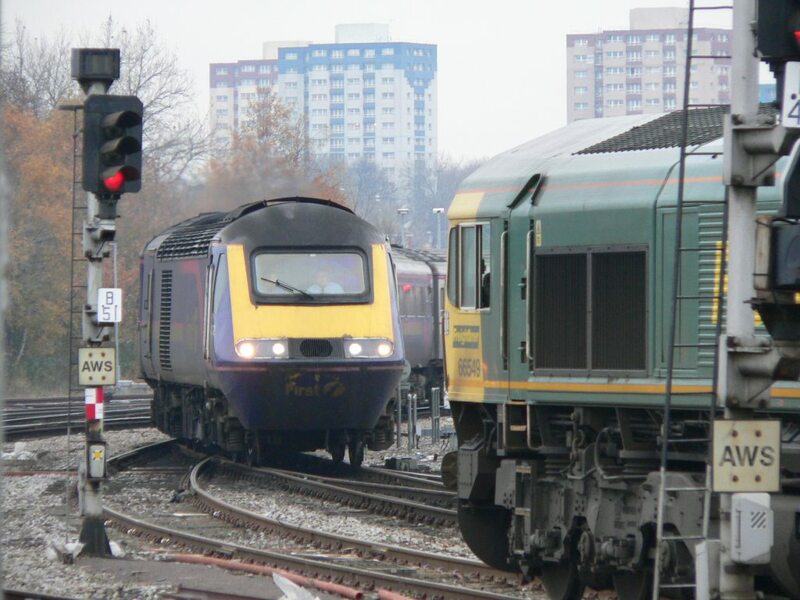 Two very different looking GM engined machines. 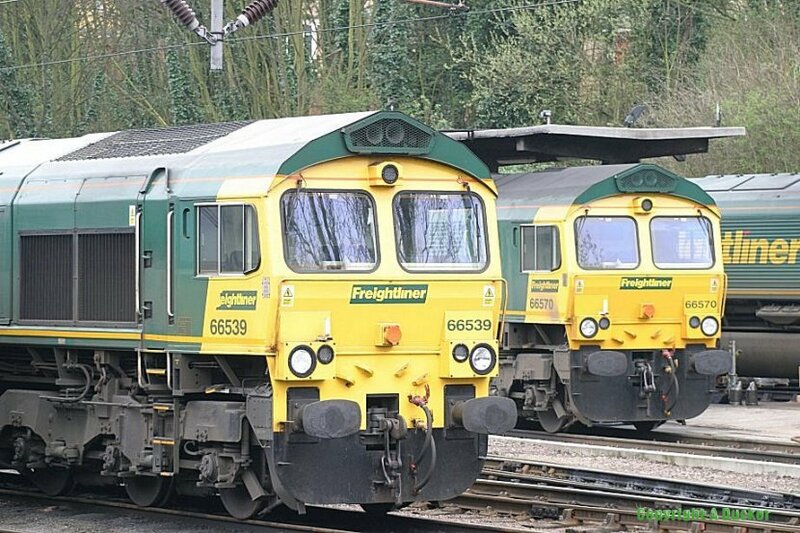 An ex-class 47 now 57004 is seen alongside 66540 at Freightliner's Ipswich stabling point on the 31st August 2004. 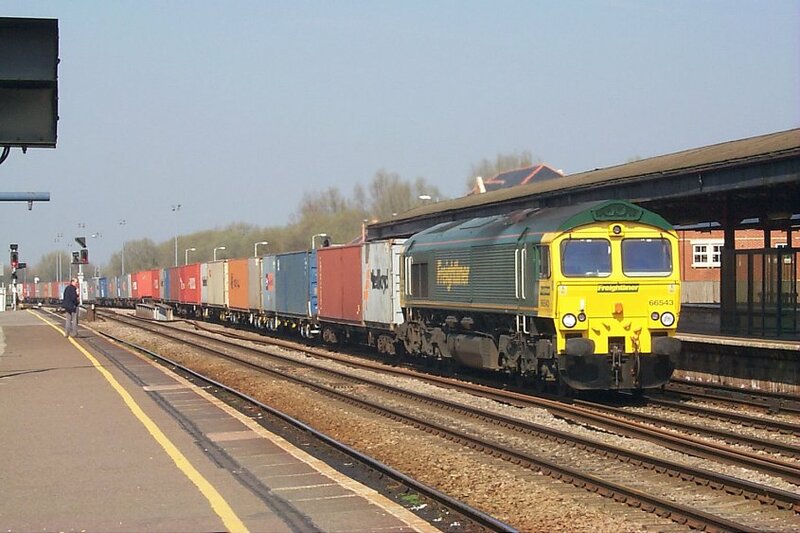 66536 brings its liner through Albany South on the 27th April 2005.